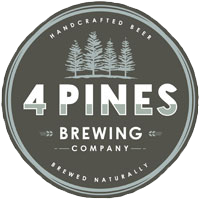 OK. We need to start with the name and the design because, as with many of 4 Pines’ Keller Door beers, they’ve done an epic job. The name is kept simple: Kiwi Brut IPA, for a brut IPA with all New Zealand hops and kiwifruit. The design? So much New Zealand (real and fantasy) packed into one label: Gandalf playing cricket; a hobbit hole; a kiwi bird floating through the air; a couple of figures who look like sheep at a glance, but are actually orcs(! ); and a whale wearing an All Blacks jersey leaping out of the water in front of snow capped mountains. Ahem. Right. Now onto the beer. It pours the colour of a piece of amber. (Seriously. Google "amber" and look at this beer. They’re the EXACT SAME COLOUR.) The aroma is bright and hoppy, carrying a little kiwifruit, but that first sip hits you like Gandalf hitting a six. The tang of the kiwifruit ties in with a burst of passionfruit and grapefruit from the hops (Taiheke, Riwaka, Wai-iti, and Moutere, for those playing at home). And now that kiwifruit is on the mind (“Don’t think about pink elephants!”), the fizzy sensation on the tongue is reminiscent of the fuzzy skin of those weird little fruits. 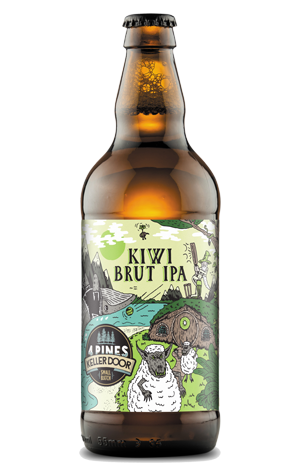 But the flavour of the kiwifruit returns to its hole and lets the hop flavours take over as the beer warms up, with a little grapefruit and a lot of oily, resinous pine emerging from the depths. As with most Brut IPAs, however, don’t let the drinkability fool you – at 7 percent ABV, this beer is an orc in sheep’s clothing.